The Guardian features an interview with Defence Secretary Gavin Williamson who reflected on his visit to Africa last week. The interview focused on the UK's commitment across Africa. The Defence Secretary announced the UK's first specialist Army training team which will tackle sexual violence and the use of female suicide bombers. The expert team will be deployed to east Africa in the coming weeks. It's not just the right thing to do because you want to stop an evil act, but it's also the right thing to do because it makes places and people more secure. The Telegraph reports on the UK and Norway's plans to co-operate closely on Maritime Patrol Aircraft in the North Atlantic. The article highlights that the UK's new fleet of sub-hunters will work closely alongside Norwegian forces as a deterrent to the Russian threat. The RAF will take delivery next year of the first of nine P-8A aircraft, costing £3 billion. The UK will explore with Norway ways in which we together can leverage the maritime reconnaissance and anti-submarine warfare capabilities of the P-8A Maritime Patrol Aircraft to improve North Atlantic security, thereby enhancing NATO security. The BBC's One Show covered the arrival of the five new F-35 jets to RAF Marham. Historian Dan Snow attended the arrival last Friday and interviewed key personnel, including pilots and engineers. Lightning Force Commander David Bradshaw was interviewed, saying that the jet is the "next generation of combat". Snow concluded the show by saying that by the end of the year the jets will be operational and the RAF will be flying the world's most advanced fighter. 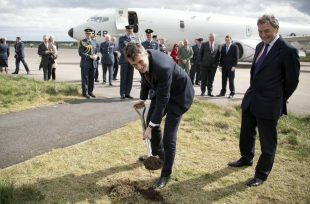 Image of the Defence Secretary Gavin Williamson cutting the first turf on a £132m facility for the UK’s new fleet of submarine hunting Poseidon Maritime Patrol Aircraft (MPA) at RAF Lossiemouth.